This interdisciplinary peace-building effort was supported by the Psychology department through the development of two core peace-building courses, namely Positive Psychology and the Psychology of Peace. 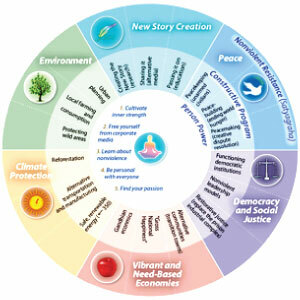 The formulation of these courses was built upon the “Roadmap Model,” taken from the Metta Center for Nonviolence (metacenter.org), depicting peace-building as a transformational learning process that places primary importance on the “self” as a peace-builder and extends out to the interrelated social, political, institutional, and ecological spheres of peace. Peace-building then originates from the individual and flows in the direction of outward change. (See below for RoadMap Model). The course objectives of Positive Psychology and the Psychology of Peace were created to complement the peace-building process described in the RoadMap Model. Positive Psychology is the newest discipline in Psychology originating from the Humanistic Psychology. A central theme of Humanistic Psychology is that people have a tendency towards growth and the fulfillment of their potential. As such, Positive Psychology emphasizes the “intrapersonal” domain of human functioning as a primary conduit to peace-building. Specifically, Positive Psychology explores the human strengths and virtues that enable individuals to thrive through studying and applying topics such as gratitude, optimism, hope, wisdom, courage, mindfulness, forgiveness, love, and positive development across the lifespan. Peace Psychology draws upon the tenets of Social Psychology and Personality Psychology to exemplify the relational foundations, or interpersonal foundations of conflict and the transformational role of conflict resolution techniques. The objectives of the course are met through exploring public policy issues of violence, the psychological effects of non-violence, conflict resolution, and the potent force of social movements towards peace. The Peace Psychology curriculum is designed to investigate the causes and consequences of violence on an interpersonal and intergroup level. The topical areas noted in Positive Psychology are balanced by the course goals of Peace Psychology. Together, both courses create a comprehensive understanding of the peace-building process. Both courses embody a style of learning that emphasizes the full development of the peace-builder through engaging in modes of self-reflection and analytic thinking necessary for internalizing and practicing the principles and processes of peace. 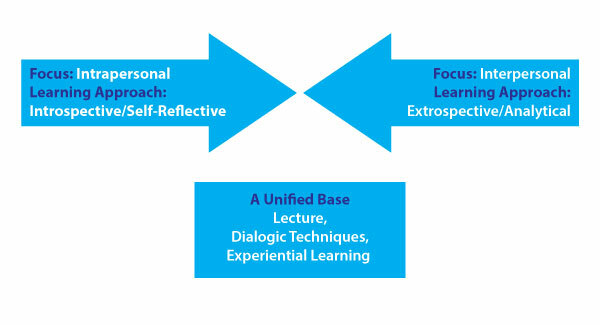 It is a learner-centered process that combines both “introspective” and “extrospective” learning practices (See learning model below). All lecture content and practical exercises are designed to nurture the essential capacities needed for students to be agents of change, while encouraging participation in action-oriented problem solving in the community as a path to creating possible solutions to current social problems. The foundation of peace building is initially set through lecture and dialogical techniques and expanded upon through experientially based exercises selected to demonstrate the necessity of concrete action in the peace-building process. Experientially based exercises in Positive Psychology were designed to emphasize the role of personhood and self-reflection in the peace building process. Peace Psychology incorporates exercises that emphasize both social context and relational practices in the cultivation of peace. These points are illustrated through a three dimensional exercise incorporating critical thinking, cooperative learning, and conflict resolution in order to foster a deeper understanding of social conflict and problem solving. Peace building exercises were selected from an active learning model in order to provide students with a set of tools they apply and incorporate into their lives. As with any social movement, participants need two key elements: strategy and unity. By incorporating experiential based exercises, Positive Psychology and Peace Psychology empower students with tactical approaches to cultivate peace in their own life and the social contexts in which they inhabit. However, students also learn unity as an important core of the peace-building process. Through unity, students learn to go beyond dualistic thinking to realize the power of human interconnectedness as a transformative pathway in the peace building process.